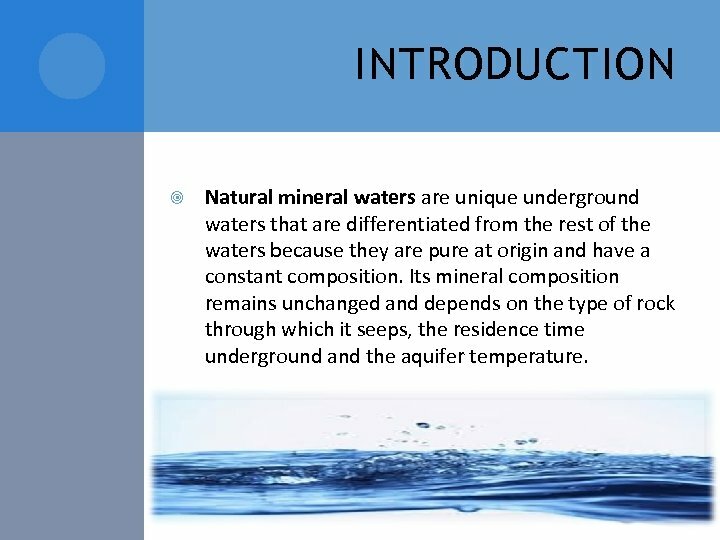 INTRODUCTION Natural mineral waters are unique underground waters that are differentiated from the rest of the waters because they are pure at origin and have a constant composition. Its mineral composition remains unchanged and depends on the type of rock through which it seeps, the residence time underground and the aquifer temperature. 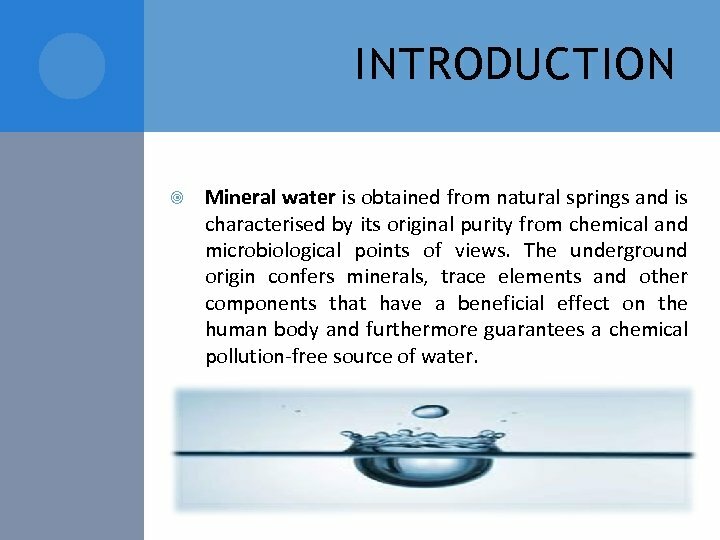 INTRODUCTION Mineral water is obtained from natural springs and is characterised by its original purity from chemical and microbiological points of views. The underground origin confers minerals, trace elements and other components that have a beneficial effect on the human body and furthermore guarantees a chemical pollution-free source of water. 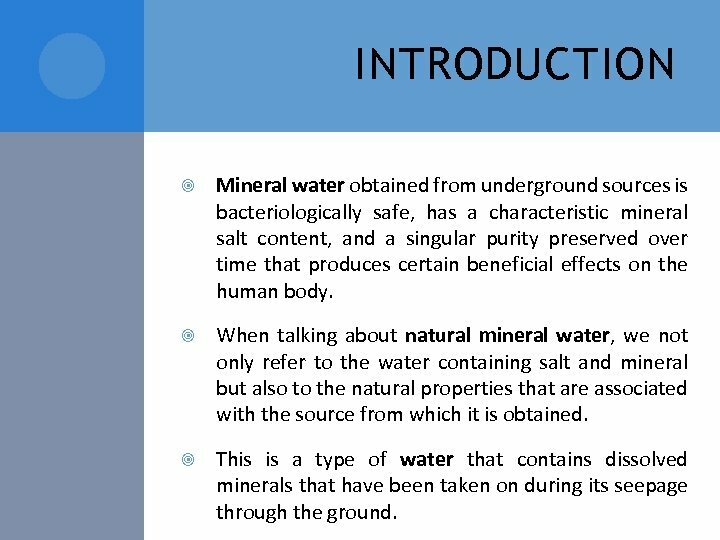 INTRODUCTION Mineral water obtained from underground sources is bacteriologically safe, has a characteristic mineral salt content, and a singular purity preserved over time that produces certain beneficial effects on the human body. When talking about natural mineral water, we not only refer to the water containing salt and mineral but also to the natural properties that are associated with the source from which it is obtained. This is a type of water that contains dissolved minerals that have been taken on during its seepage through the ground. 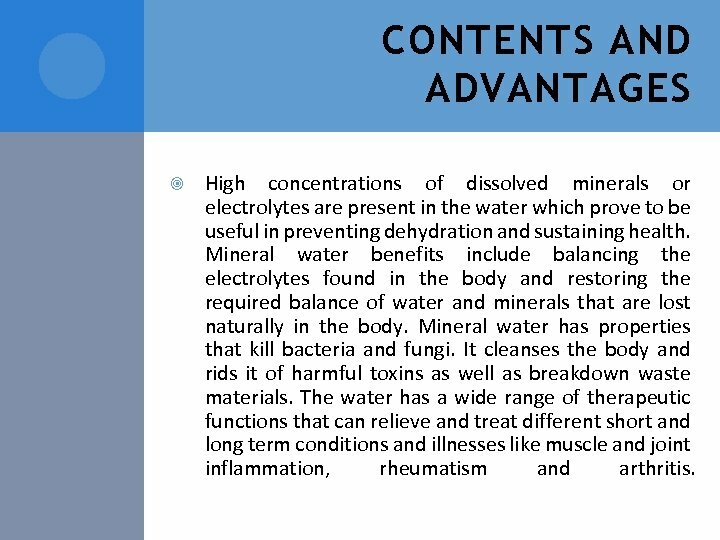 CONTENTS AND ADVANTAGES High concentrations of dissolved minerals or electrolytes are present in the water which prove to be useful in preventing dehydration and sustaining health. Mineral water benefits include balancing the electrolytes found in the body and restoring the required balance of water and minerals that are lost naturally in the body. Mineral water has properties that kill bacteria and fungi. It cleanses the body and rids it of harmful toxins as well as breakdown waste materials. 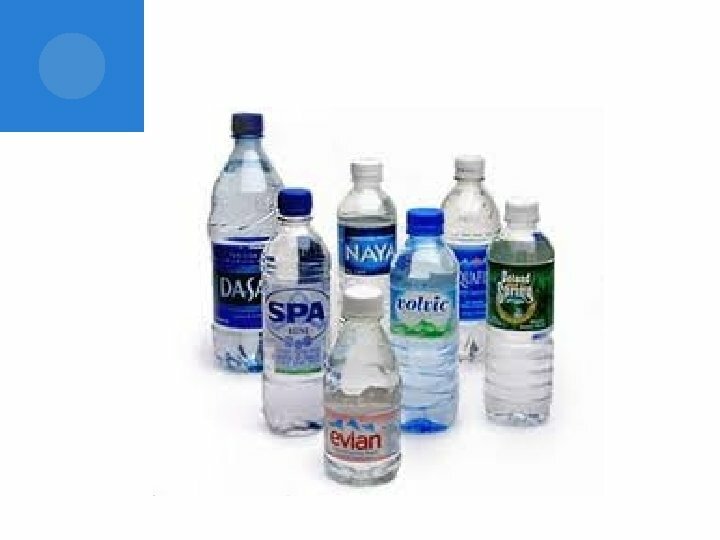 The water has a wide range of therapeutic functions that can relieve and treat different short and long term conditions and illnesses like muscle and joint inflammation, rheumatism and arthritis. 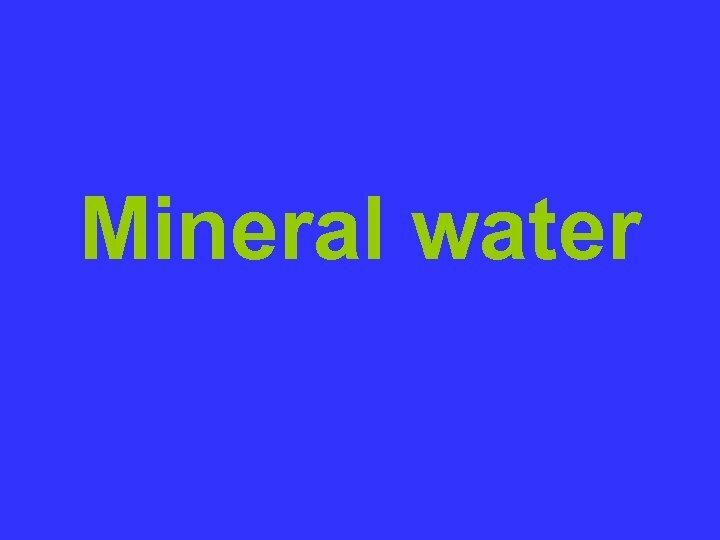 THE AVAILABLE MINERALS There are several naturally present minerals in the water providing various benefits. Magnesium is a known stress reliever which is concentrated in muscles and the bones. 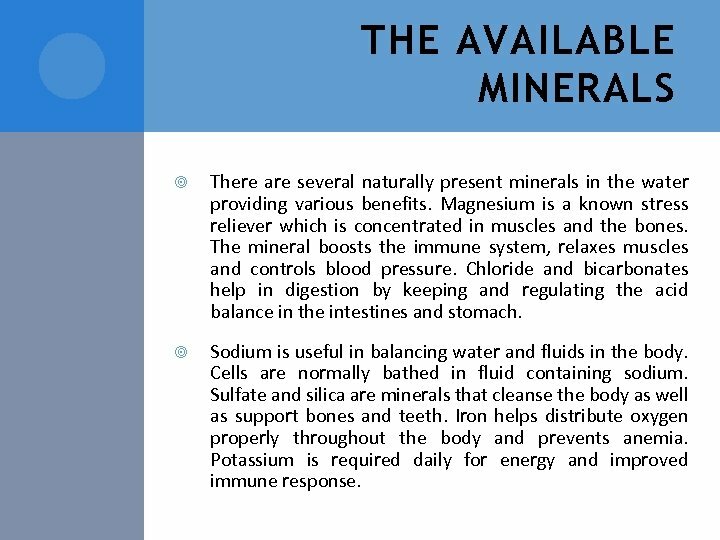 The mineral boosts the immune system, relaxes muscles and controls blood pressure. Chloride and bicarbonates help in digestion by keeping and regulating the acid balance in the intestines and stomach. Sodium is useful in balancing water and fluids in the body. Cells are normally bathed in fluid containing sodium. Sulfate and silica are minerals that cleanse the body as well as support bones and teeth. Iron helps distribute oxygen properly throughout the body and prevents anemia. Potassium is required daily for energy and improved immune response. 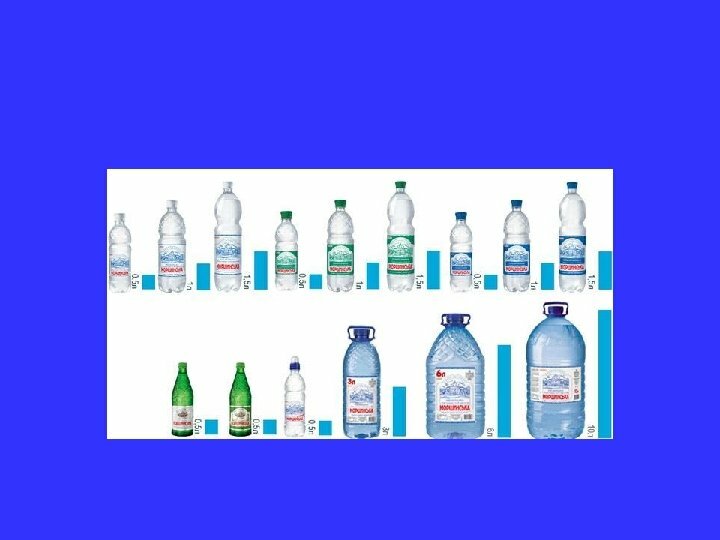 TYPES OF MINERAL WATER. 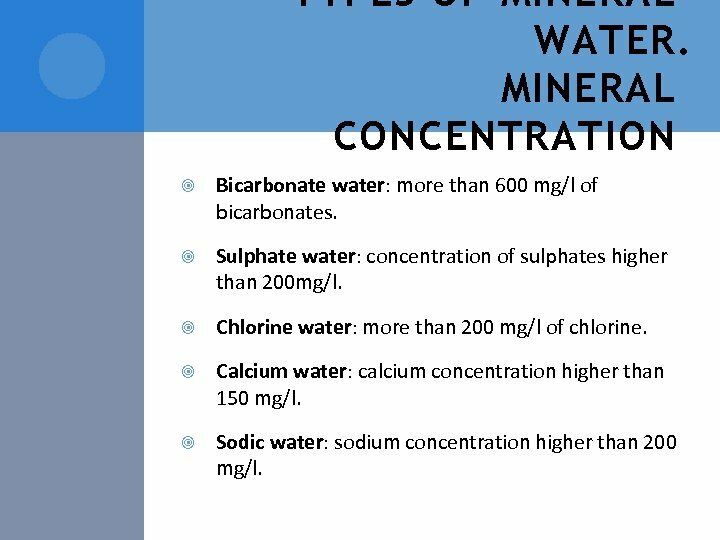 MINERAL CONCENTRATION Bicarbonate water: more than 600 mg/l of bicarbonates. Sulphate water: concentration of sulphates higher than 200 mg/l. Chlorine water: more than 200 mg/l of chlorine. Calcium water: calcium concentration higher than 150 mg/l. Sodic water: sodium concentration higher than 200 mg/l. 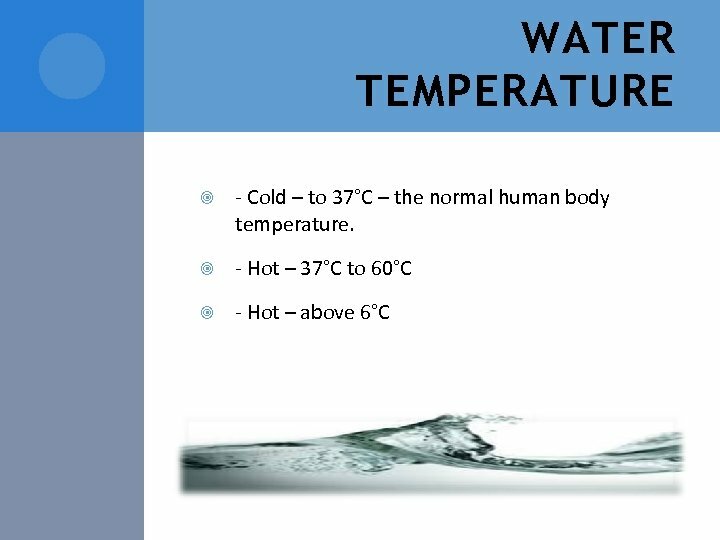 MINERAL WATER PROPERTIES Everyone knows that the water freezes at 32, 00 F or 0, 00 C degrees. While freezing it can broke pipes or any other kind of the vessels it is in. But if it is kept inside the capillaries which have the dimensions less than a hair thickness, it will remain fluid even at a very low temperature below zero. It is amazing. How many secrets more does the water keep inside? Everyone knows that the human body consists of the water. 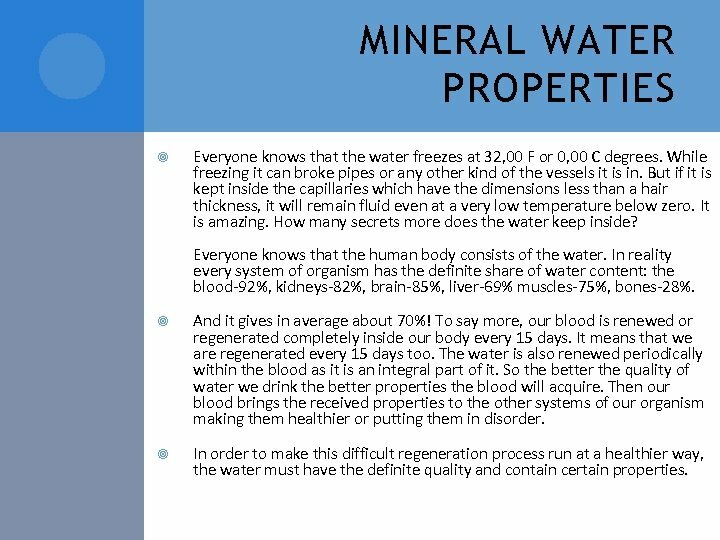 In reality every system of organism has the definite share of water content: the blood-92%, kidneys-82%, brain-85%, liver-69% muscles-75%, bones-28%. And it gives in average about 70%! To say more, our blood is renewed or regenerated completely inside our body every 15 days. It means that we are regenerated every 15 days too. The water is also renewed periodically within the blood as it is an integral part of it. So the better the quality of water we drink the better properties the blood will acquire. Then our blood brings the received properties to the other systems of our organism making them healthier or putting them in disorder. In order to make this difficult regeneration process run at a healthier way, the water must have the definite quality and contain certain properties. PROPERTIES First one, and the most popular is cleanliness. 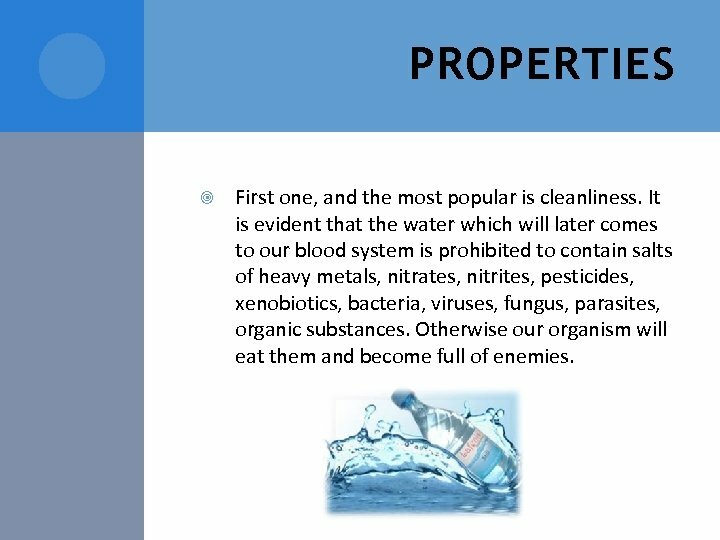 It is evident that the water which will later comes to our blood system is prohibited to contain salts of heavy metals, nitrates, nitrites, pesticides, xenobiotics, bacteria, viruses, fungus, parasites, organic substances. Otherwise our organism will eat them and become full of enemies. 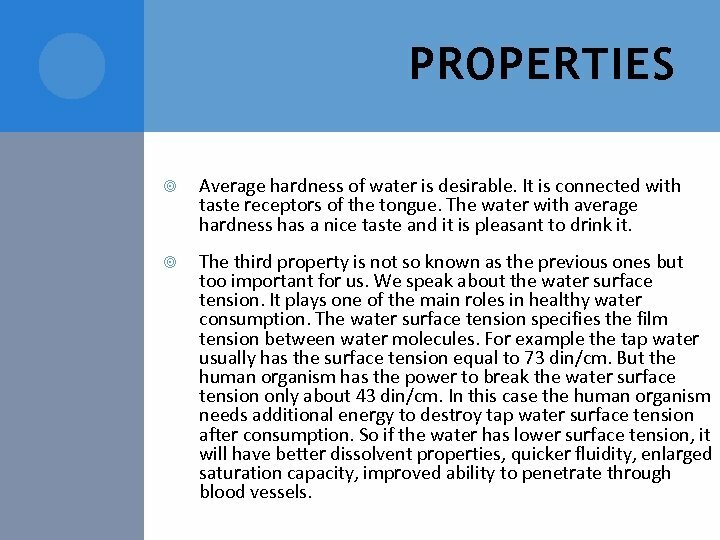 PROPERTIES Average hardness of water is desirable. It is connected with taste receptors of the tongue. The water with average hardness has a nice taste and it is pleasant to drink it. The third property is not so known as the previous ones but too important for us. We speak about the water surface tension. It plays one of the main roles in healthy water consumption. The water surface tension specifies the film tension between water molecules. For example the tap water usually has the surface tension equal to 73 din/cm. But the human organism has the power to break the water surface tension only about 43 din/cm. In this case the human organism needs additional energy to destroy tap water surface tension after consumption. So if the water has lower surface tension, it will have better dissolvent properties, quicker fluidity, enlarged saturation capacity, improved ability to penetrate through blood vessels. PROPERTIES Antioxidant Properties. 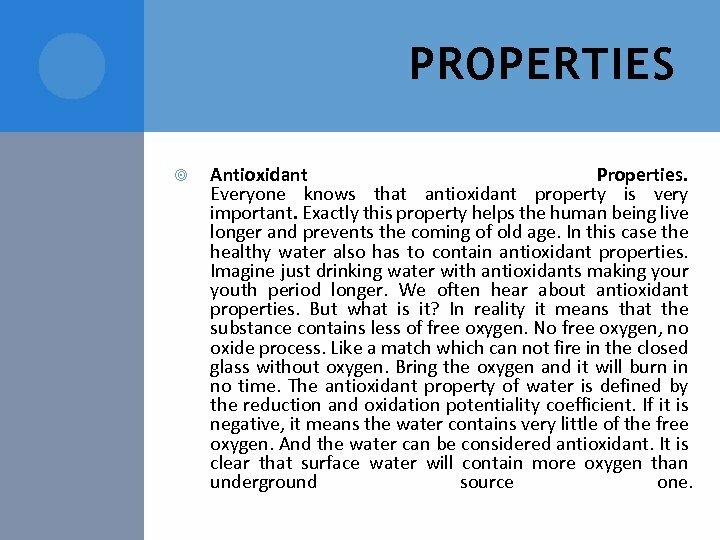 Everyone knows that antioxidant property is very important. Exactly this property helps the human being live longer and prevents the coming of old age. In this case the healthy water also has to contain antioxidant properties. Imagine just drinking water with antioxidants making your youth period longer. We often hear about antioxidant properties. But what is it? In reality it means that the substance contains less of free oxygen. No free oxygen, no oxide process. Like a match which can not fire in the closed glass without oxygen. Bring the oxygen and it will burn in no time. The antioxidant property of water is defined by the reduction and oxidation potentiality coefficient. If it is negative, it means the water contains very little of the free oxygen. And the water can be considered antioxidant. It is clear that surface water will contain more oxygen than underground source one. PROPERTIES Low mineralized mineral water is accepted better by our organism. As a matter of fact our organism balance is closely connected with the amount of sodium and potassium salts consumption. The water is a nice dissolvent liquid. It brings the salt through our organism very quickly and feeds the cells with salts. 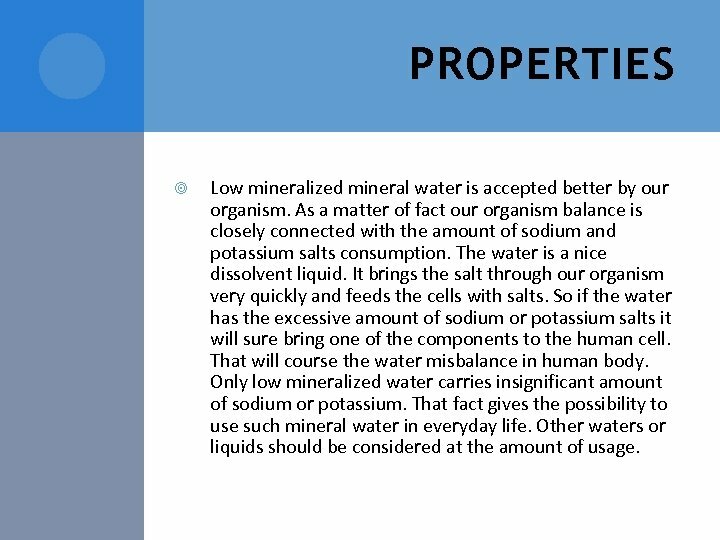 So if the water has the excessive amount of sodium or potassium salts it will sure bring one of the components to the human cell. That will course the water misbalance in human body. 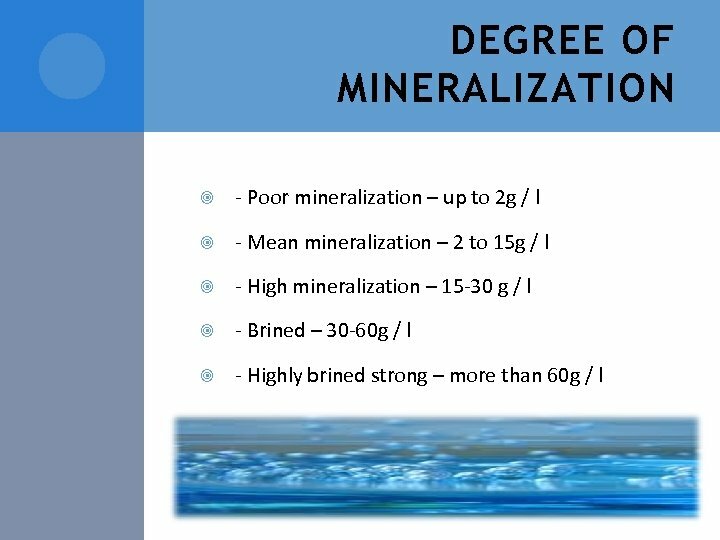 Only low mineralized water carries insignificant amount of sodium or potassium. That fact gives the possibility to use such mineral water in everyday life. Other waters or liquids should be considered at the amount of usage. • Mineral water is water from a mineral spring containing various minerals such as salts and sulfur compounds. 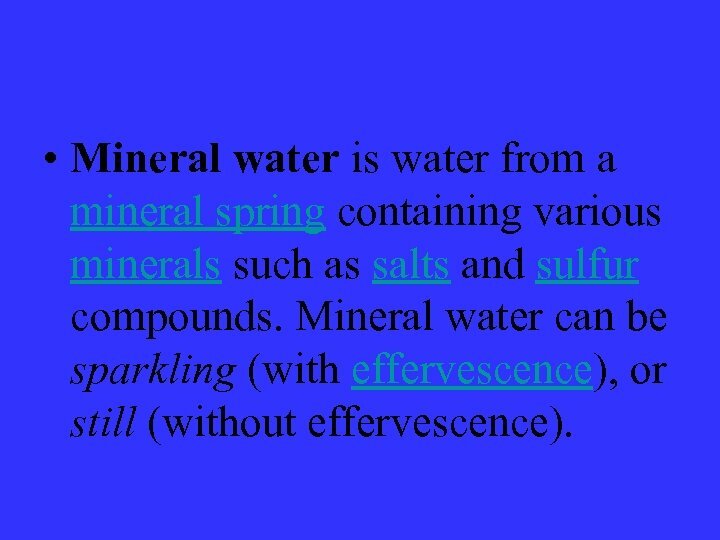 Mineral water can be sparkling (with effervescence), or still (without effervescence). • Active tourist centres have grown up around many mineral water sites since ancient times, such as Hungary, Hisarya (Bulgaria), Bílina (Czech Republic), Vichy (France), Jermuk (Armenia), Yessentuki (Russia), Spa (Belgium), Krynica-Zdrój (Poland), Sulphur Baths (Tbilisi, Republic of Georgia), Bath (England), or Karlovy Vary (Czech Republic), Myrhorods'ka (Ukraine). In Romania, a country enjoying a privileged position as home to over one-third of the European mineral and thermal springs, resorts developed since antiquity in places such as Băile Herculane, Geoagiu or Slănic. Tourist development resulted in spa towns and hydropathic hotels (often shortened to "hydros"). • Mineral water of Tryskavez • Since ancient times, we know that mineral water from natural sources has healing properties. Such water will not only quench the thirst, but also help to get rid of diseases. • The queen of mineral water of Truskavets resort is «Naftusya» . 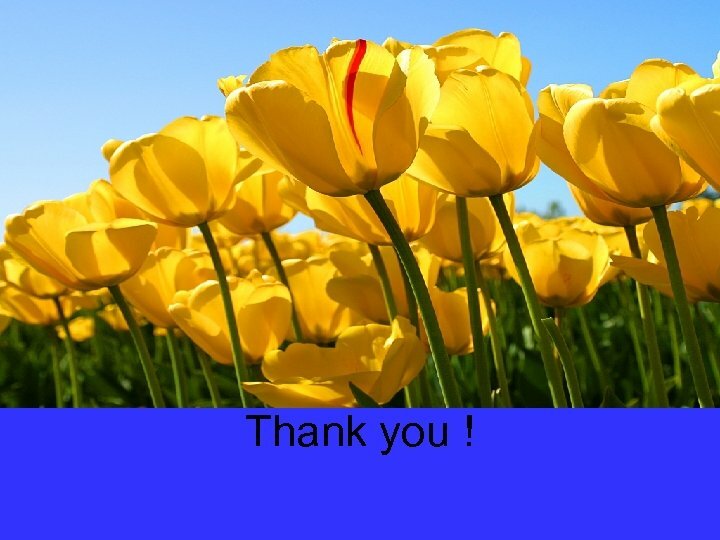 It is original both in content and in its physiological effects on the human body. «Naftusya» due to the low mineralization (up to 0, 78 g/l) and rich content of organic matter (8, 35 -23, 8 mg/l), stimulates the discharge of small stones and sand from the kidneys, gall bladder, urinary and biliary tract, reduces lithogenicity (the tendency to form stones) of urine and bile, ie eliminates the risk of stone formation. 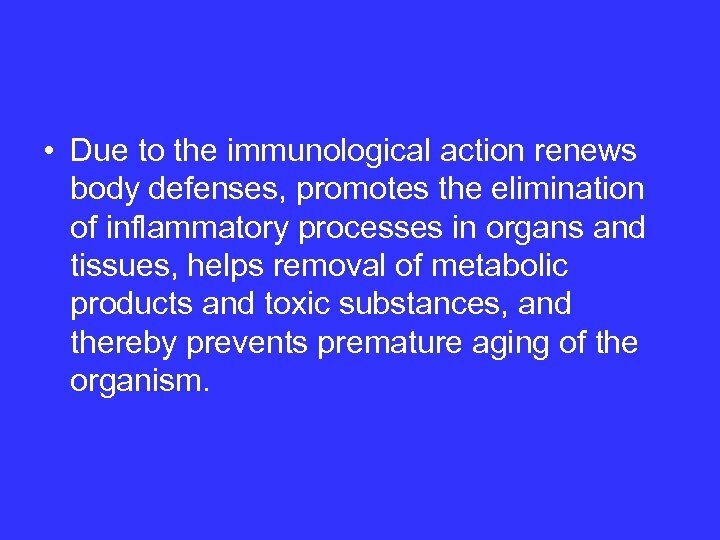 • Due to the immunological action renews body defenses, promotes the elimination of inflammatory processes in organs and tissues, helps removal of metabolic products and toxic substances, and thereby prevents premature aging of the organism. • The source number 1 — mineral water «Maria» complements the list of mineral waters of Truskavets. This is chloride-sulphate-sodium water, which contains from 4 to 7 g/l of mineral salts, 42 mg/l of free carbon dioxide. 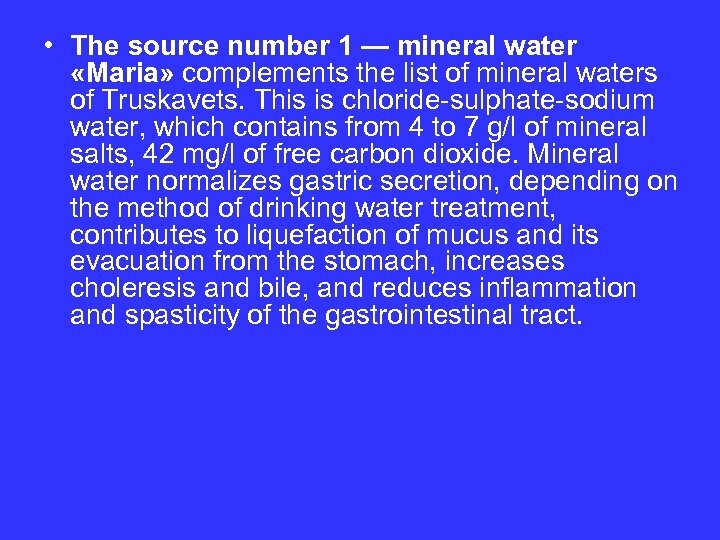 Mineral water normalizes gastric secretion, depending on the method of drinking water treatment, contributes to liquefaction of mucus and its evacuation from the stomach, increases choleresis and bile, and reduces inflammation and spasticity of the gastrointestinal tract. 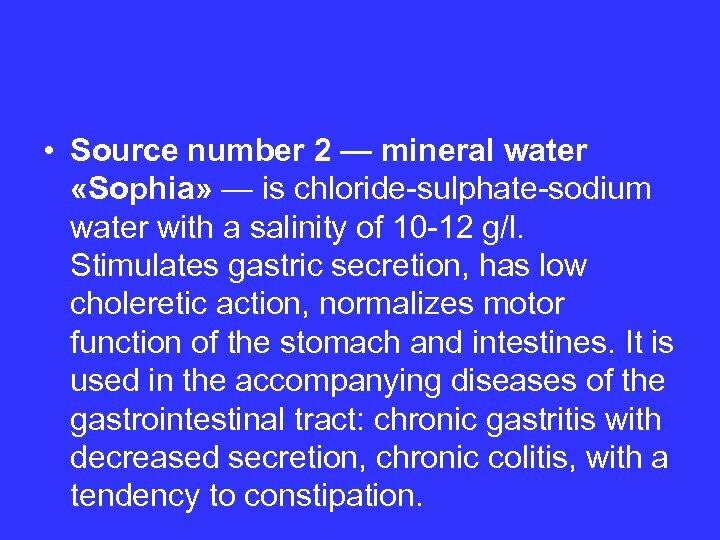 • Source number 2 — mineral water «Sophia» — is chloride-sulphate-sodium water with a salinity of 10 -12 g/l. Stimulates gastric secretion, has low choleretic action, normalizes motor function of the stomach and intestines. It is used in the accompanying diseases of the gastrointestinal tract: chronic gastritis with decreased secretion, chronic colitis, with a tendency to constipation. • In the central pump room, you can use the source number 3 — mineral water «Bronislava» for rinsing the mouth, throat, nose and nasopharynx (chronic tonsillitis, periodontitis). 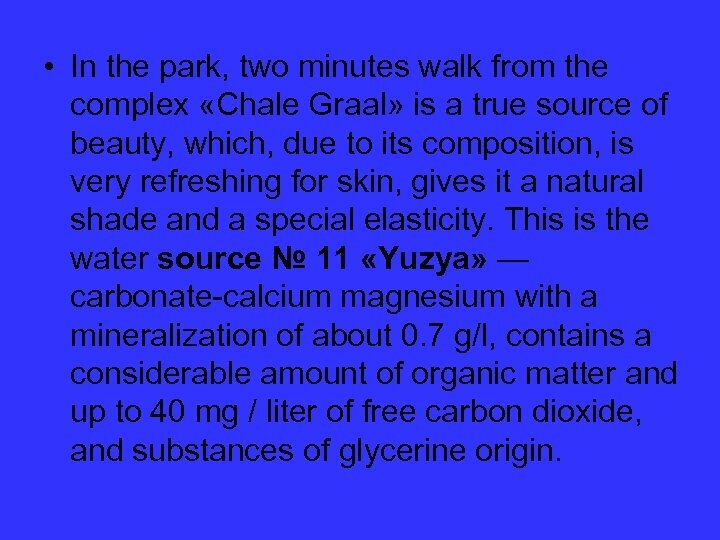 • In the park, two minutes walk from the complex «Chale Graal» is a true source of beauty, which, due to its composition, is very refreshing for skin, gives it a natural shade and a special elasticity. This is the water source № 11 «Yuzya» — carbonate-calcium magnesium with a mineralization of about 0. 7 g/l, contains a considerable amount of organic matter and up to 40 mg / liter of free carbon dioxide, and substances of glycerine origin. • Source № 4 C — mineral water «Soda» - is a unique type of alkaline mineral spring «Borjomi» originally from Shodnica. Mineral water in its composition carbonate, bicarbonate, sodium, high salinity (8 -11 g/l), neutral, and cold. It includes a therapeutic concentration of fluorine, boron, and hydrogen carbonate 1, 4 -3, 8 g/l. 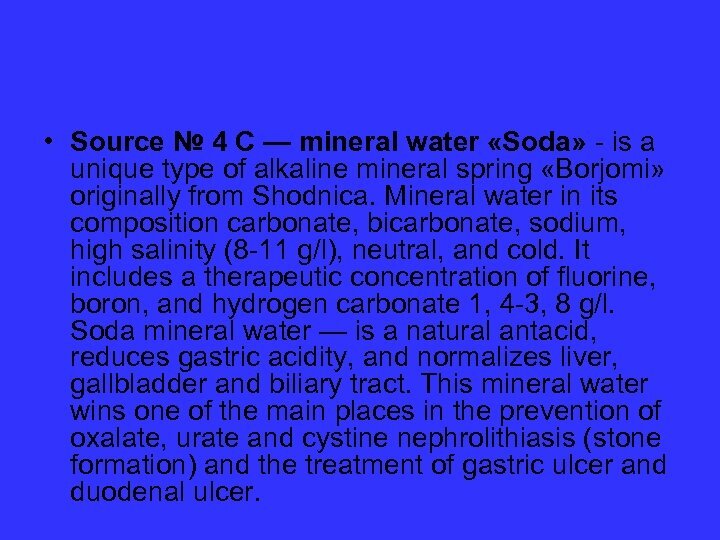 Soda mineral water — is a natural antacid, reduces gastric acidity, and normalizes liver, gallbladder and biliary tract. This mineral water wins one of the main places in the prevention of oxalate, urate and cystine nephrolithiasis (stone formation) and the treatment of gastric ulcer and duodenal ulcer. 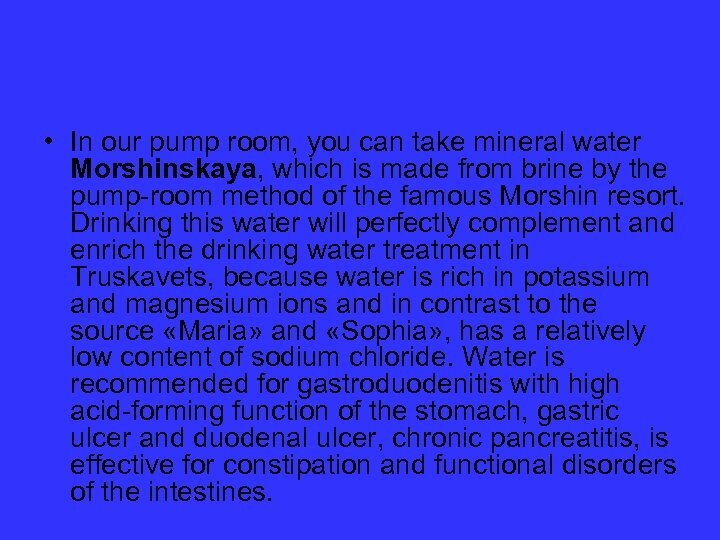 • In our pump room, you can take mineral water Morshinskaya, which is made from brine by the pump-room method of the famous Morshin resort. Drinking this water will perfectly complement and enrich the drinking water treatment in Truskavets, because water is rich in potassium and magnesium ions and in contrast to the source «Maria» and «Sophia» , has a relatively low content of sodium chloride. Water is recommended for gastroduodenitis with high acid-forming function of the stomach, gastric ulcer and duodenal ulcer, chronic pancreatitis, is effective for constipation and functional disorders of the intestines.